Award-winning author and feature columnist for The Globe and Mail, Doug Saunders argues we need 100 million Canadians if we're to outgrow our colonial past and build a safer, greener, more prosperous future. 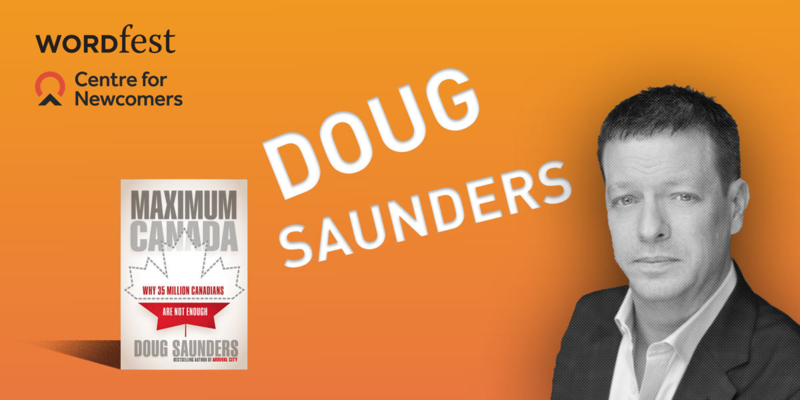 Join the Centre for Newcomers and Wordfest as we celebrate the launch of the 30th Anniversary Legacy Gift to the Community, with an unforgettable conversation with Doug Saunders, author of MAXIMUM CANADA. Hosted by Zain Velji, this event features an on stage interview, followed by an audience Q&A and book signing. Cash bar available. In a rare and bold vision for Canada's future, MAXIMUM CANADA: Why 35 Million Canadians Aren’t Enough proposes a most audacious way forward: To avoid global obscurity and create lasting prosperity, to build equality and reconciliation of indigenous and regional divides, and to ensure economic and ecological sustainability, Canada needs to triple its population – and this can be done without a large immigration increase. Saunders' previous bestsellers have won the Donner Prize, the National Library of China Wenjin Book Award and the Schelling Prize for Architectural Theory, and been a finalist for the Lionel Gelber Prize and the Shaughnessy Cohen Prize for Political Writing. And Saunders is celebrated internationally for his commentary and analysis. The German Pavilion at the 2016 Venice Biennale was organized around and devoted to his debut, Arrival City. CNN, Deutsche Welle and Europe's ARTE network have produced programmes devoted to his ideas and he has won the National Newspaper Award on five occasions. During the 2017 Calgary municipal election, Zain Velji acted as Campaign Manager for the successful Re-elect Nenshi for Mayor Campaign. As VP Strategy for Northweather, Velji has a decade of experience in political, business, and nonprofit communications, as well as marketing and engagement. Velji is also a political commentator who appears weekly on CBC radio and television. In addition, he serves on the board of the YMCA Calgary, Calgary Reads, and The Canadian Children’s Book Centre. Velji is also a member of the World Economic Forum’s Global Shaper community. Twitter: @zainvelji. As part of their 30th anniversary, the Centre for Newcomers is hosting a series of live events throughout Calgary to encourage discussion about the importance of immigration and the positive impact immigrants have had on Canada as a whole. In tandem with these discussions, Centre for Newcomers is encouraging Calgarians to share their stories to create a living snapshot of Calgary’s cultural legacy for generations to come. The goal is to collect 1,000 stories from everyday Calgarians, such as yourself. Unless you’re from an Indigenous family, every Canadian came to our great country from somewhere else. Many of us grew up hearing these stories from our parents, grandparents or great-grandparents. It’s become not only part of our individual heritage but is also part of Calgary’s collective inheritance. Record your family's immigration story, upload it to your favourite social media platform using #myimmigrantstory and share your gift with the community.